Tackling Trout is an established fly fishing school specifically designed to meet numerous requests for a course that embraces the essential skills for successful trout fly fishing. Tackling trout does exactly that and is flexible enough to cater for individual needs during the event. Rods, reels and variety of fly lines by leading manufacturers are available for use during the course if required. Tackling Trout courses are arranged for private groups of 3 to 8 persons. The main objective of the course is to enable students to understand the theory and methods of trout fishing and other types of fishing using single handed fly casting techniques and to practice the casts under Ally’s expert instruction to achieve a reasonable standard of performance within the two day program. Previous experience of fly casting is not necessary because the lessons will assume no previous knowledge. Starting with the essential rules of fly casting each student’s understanding of the techniques will be developed in a clear manner with the aim of achieving efficient casting styles. Practical trout fishing tactics and an introduction to fly tying and entomology are also included. The course begins with introductions followed by a short illustrated talk/discussion about safety at the waterside, choosing appropriate tackle and fly casting theory. Next we have tackle assembly and learning essential knots and connections. 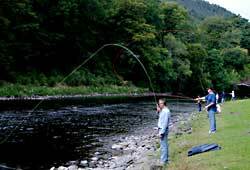 Then its fly casting for Practical Session 1 including the basic Roll and Overhead casts, direction changes and a demonstration and explanations for common casting faults and their cures. Session 2 considers accuracy and distance casting. Session 3 looks at fly fishing entomology and fish food items and their imitation. Session 4 is about reading water and wet fly fishing methods. Waders off! After dinner there is a fly tying demonstration and if anyone wish to participate and tie a few flies they will be more than welcome to do so. THe following daywe deal with winds, false casting and the roll cast pickup. Next comes upstream fishing methods, nymphs, wet flies and dry fly fishing methods. After lunch we consider playing, landing and releasing fish and then we spend the rest of the day catching trout, fingers crossed! Finally we review, hand out notes, get feedback and hopefully wave goodbye to our new friends who will put their new found skills to good use.